TOKYO (AP) – Japan marked the 69th anniversary of the atomic bombing of Hiroshima by the U.S. on Wednesday, as Mayor Kazumi Matsui called on President Obama and other world leaders to visit the city to see the scars of the atomic bombing first hand. In his “peace declaration” speech, Matsui invited world leaders to his once-devastated hometown, referring to a proposal made at a ministerial meeting in April of the Non-Proliferation and Disarmament Initiative in Hiroshima, urging them to visit Hiroshima and Nagasaki. Hiroshima launched a campaign this year to send invitation letters to Obama, written on papers recycled from tens of millions of “origami” cranes – a symbol of peace – sent from around the world. About 45,000 people stood for a minute of silence at the ceremony in Hiroshima’s peace park near the epicenter of the 1945 attack that killed up to 140,000 people. A second bombing, over Nagasaki three days later, killed another 70,000, prompting Japan’s surrender in World War II. The number of surviving victims, known as “hibakusha,” was just more than 190,000 this year. Their average age is 79, and many of the attendants at the ceremony were their younger relatives and descendants. 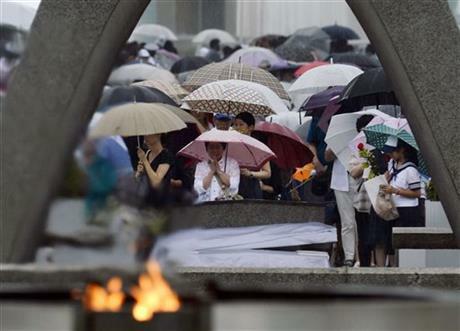 Hiroshima officials said 5,507 survivors died over the past year. The anniversary comes as Japan is divided over Prime Minister Shinzo Abe’s recent Cabinet decision to allow the country’s military to defend foreign countries and play greater roles overseas. To achieve the goal, Abe’s Cabinet revised its interpretation of the country’s war-renouncing constitution, making it even more controversial. Abe, among dignitaries attending the event, said that as the sole country to have suffered nuclear attacks, Japan has the duty to seek to eliminate nuclear weapons. But he did not mention his push for a more assertive defense posture under his “proactive peace contribution” policy. Public polls show more than half of the Japanese are opposed to the decision, mainly because of sensitivity over Japan’s wartime past. Matsui did not directly refer to Abe’s recent change to the interpretation of the pacifist Article 9, which is the cornerstone of Japan’s pacifist pledge to the world. But he said the pacifist constitution is what has kept Japan out of war for 69 years.